For as long as I can remember, I've loved folk tales, fairy tales, myths and legends. I thought I would share some with you and, naturally, include some recipes as well. Look for more story/recipe combinations in the coming months. 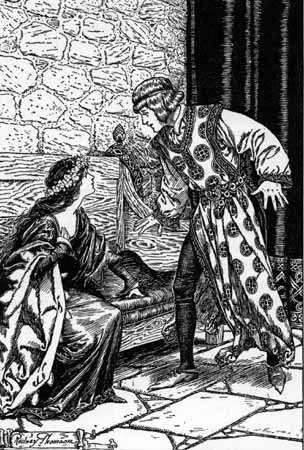 What are your favorite folk tales, fairy tales, myths or legends? Tell me in the comments section! Set up an oven rack so that it is about 1/3 of the way from the bottom of the oven. Make sure there's enough space for your large lidded skillet. Preheat oven to 325 degrees Fahrenheit. Place the sliced prunes in a bowl and cover with chicken stock. Set aside. In the skillet, melt the lard over medium-high heat. When fat is hot, add the onion, thyme leaves and a bit of salt. Cook, stirring frequently, for about ten minutes or until onion is nice and soft and translucent. Turn heat down, if needed, to keep onion from browning too much (a little is fine). Push the onions to the edges of the pan and add the butter to the center. Season the pork chops with salt and pepper and cook three minutes on each side. Remove pan from the heat, stir the prunes and chicken stock into the onions, cover the pan and bake for 15 to 20 minutes, turning and basting the chops halfway through, until they are cooked through. Remove chops to a warmed dish and reduce what is left in the pan to use as a sauce. Reduce to your desired thickness and serve over the chops. 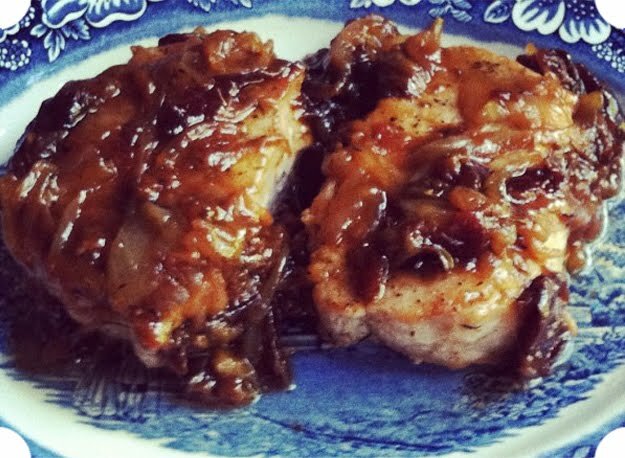 Adapted from "Côtes de Porc Poêlées" in Julia Child et al., Mastering the Art of French Cooking (New York: Knopf, 1961), 386-387 and "Stuffed Pork Chops Baked in Cider" in Favourite Somerset Recipes (Sevenoaks: J. Salmon Ltd), 19. Read more about the ingredients at this previous post. 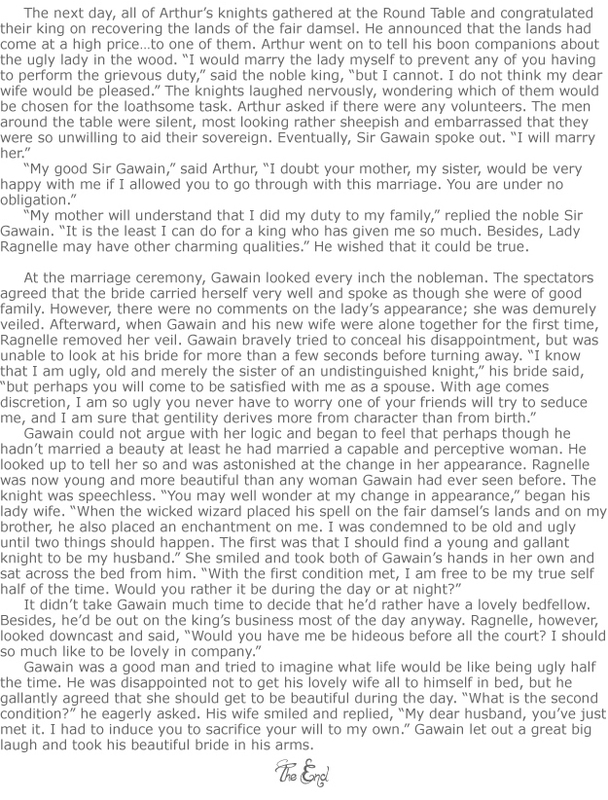 Based on “Sir Gawain’s Marriage” in Thomas Bulfinch, The Age of Chivalry (Boston: Crosby, Nichols, and Company, 1859) and “The Wedding of Sir Gawain and Dame Ragnelle,” Thomas Hahn, ed. http://www.lib.rochester.edu/camelot/teams/ragnfrm.htm. Oh man, those pork chops look seriously delicious. Now what sides did you serve this with? I'd guess potatoes or wild rice? Asparagus? I guess it's the kind of dish that could go with almost anything. I'd suggest a green vegetable and a starch. I went with green beans and mashed potatoes. However, there weren't potatoes in England until the early modern period, so if you want to be more "Arthurian," I'd suggest a different starch. Of course, if we're talking about enchantments being possible, I guess Merlin could have magically provided some anachronistic tubers or something. Me too! I especially love The Snow Queen. I enjoy your storytelling! I've always loved Greek mythology - my sons' copy of D'Aulaires' Book of Greek Myths quickly became one of my favorites, too. So much fun to read fables and legends, and even more fun to add food! I had a copy of D'Aulaires' Greek Myths, as well. Loved it. Their Norse myths book was pretty awesome, too. I am definitely making this pork dish. It looks delicious! I've never thought much about my favorite folk tales, myths, or legends. 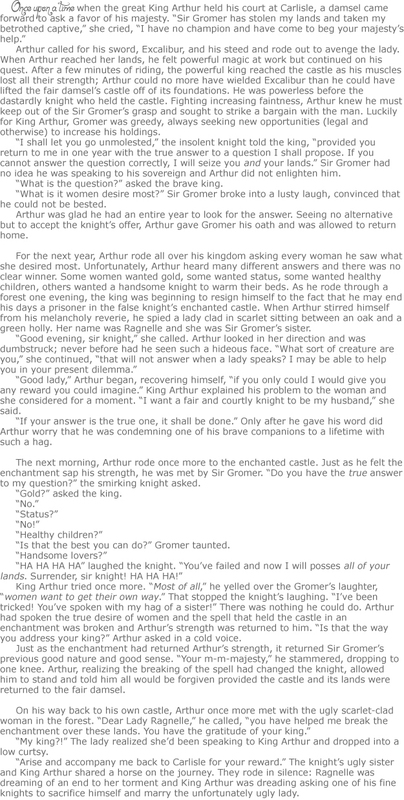 I guess I like the King Arthur stories...Will have to think about that one. Have a great weekend! And thanks for sharing these great legends and stories. I've always loved Celtic and Norse mythology and even read a lot of Greek and Eygptian mythology when I was younger. Now I tend to find myself readin about American Folk tales, espeically from my homestate of MN. Paul Bunyan and Babe, Axehandle Hounds, Balltail Cats... some of the lumberjack myths are wonderful. The pork looks so frickin good. I just can't bring myself to cook a lot in the summer, too hot, but I'm going to remember this for fall and winter. If you like "Aruthurian Tales" you should check out The Thorn and the Blossom by Theodora Goss. I got to review it earlier year, and it's worth a read for the format alone. I'm off to read your post on The Thorn and the Blossom. I always love a good book recommendation! Oh my goodness--it is hot. Cooking definitely makes me all sweaty in this weather. It's not cute. I hope you get to read it soon, it was good. I'm just reading my comment over, and my typing skills were horrible last night. Loved the story and those pork chops look delicious! So enjoyed the retelling of this story! We still have the D'Aulaires' books. They're wonderful (as you know)! I'm sure you love storytelling because we started that early. My favorite memories involve reading and then singing you to sleep!